Delicate violet orchid, photographed at Arthur R. Marshall Loxahatchee National Wildlife Refuge, Boynton Beach, Palm Beach County, in March 2017. Words to live by if you're a bee: Ignore the lovely flowers of the delicate violet orchid, Ionopsis utricularoides. They're nothing more than a waste of your time. Of course, the bee will always be drawn to those showy little blooms but it won't find the sweet nectar that it's looking for. While most plants offer the bee a fair trade of nectar in exchange for transfering pollen from one flower to another, the delicate violet orchid offers nothing. Like many of its kind, this orchid is a nectar deceptor. It lures in bees with flowers that resemble those of nectar-bearing species who then thrash about thinking the good stuff has got to be in there somewhere. They go off to the next bloom, and then the next, doing the same thing, picking up and dropping off pollen each time. 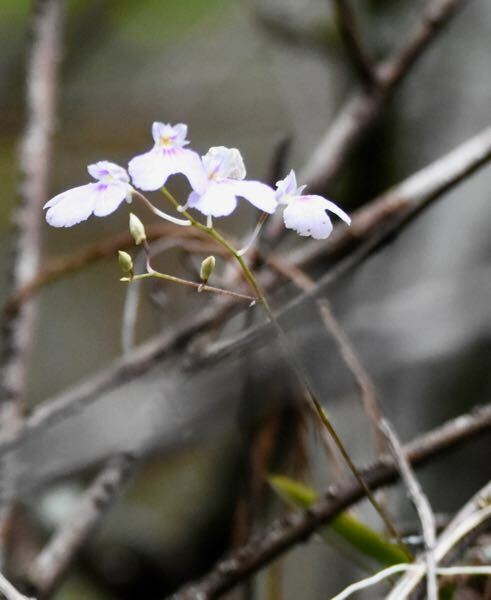 Most of the year, the delicate violet orchid is bloomless and the definition of inconspicuous. One could walk past the orchid a thousand times without noticing it. When you do see it, you wonder how those twists of roots and leathery, straplike leaves got there and how the plant ever survives. 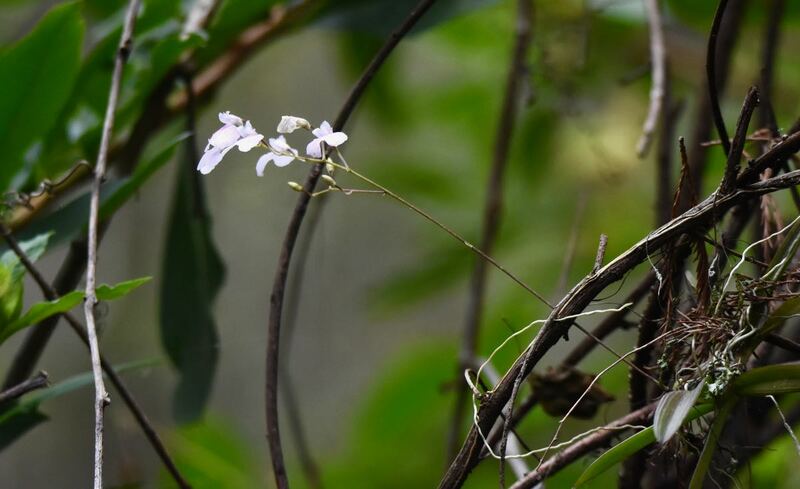 Delicate violet orchid is a twig epiphyte — an air plant that tends to grow among the small, outer branches of a tree rather than on the major branches or along the trunk. It is a Florida native and a rare one at that. Only a handful of populations are known to exist in three South Florida counties: Palm Beach, Collier and mainland Monroe. 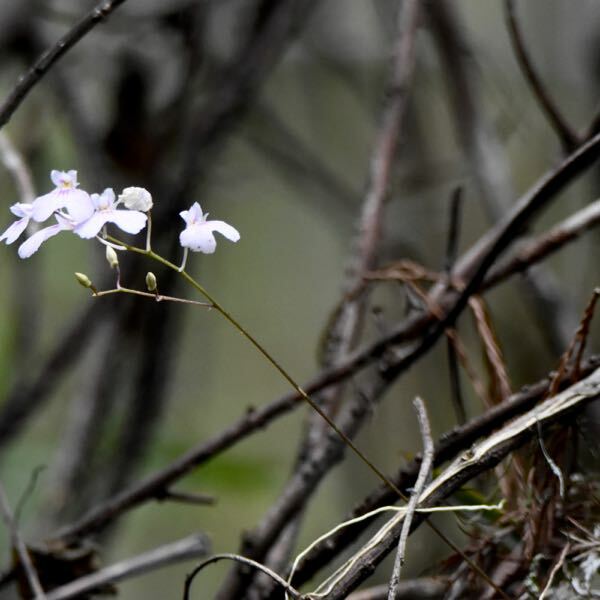 Florida law lists delicate violet orchid as endangered.However, it is not federally protected. 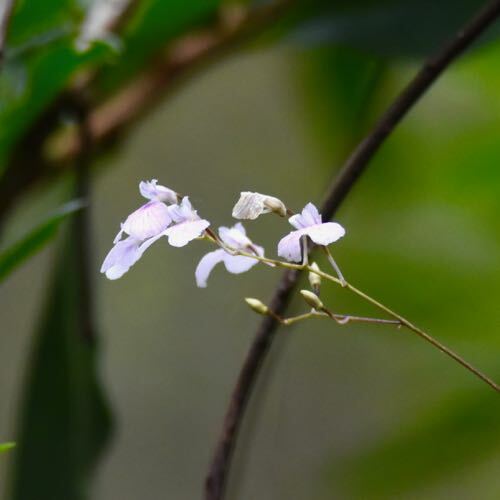 Delicate violet orchid has one of the widest distributions of any members of its family — Florida is the extreme northern end of its range, which includes the Caribbean, Mexico, Central America and South America. It's common in parts of its range. The plant's nondescript form when not in bloom adds to the difficulty in assessing how widespread it might be. In late winter, it sends out a a stalk, about a foot long, at the end of which is a cluster of flowers. Each flower has two lobes and can vary from white with a hint of red or pink at the mouth and in the veining to pale pink to rose colored, lavendar and violet. In Florida, the flowers are small to medium in but can be enormous in other places. A note about Florida's orchids. 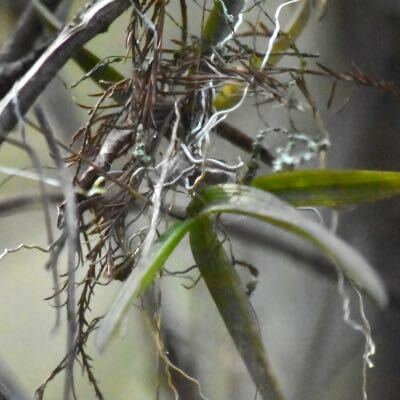 By one count, there are 99 native orchid species growing in the state, of which 56 are listed by statute as endangered, 18 as threatened and two as commercially exploited. They are, as those numbers indicate, one of the rarest families of native plants in Florida. Collectors, poachers and habitat loss have made native orchids even rarer. The man-made change in the state's natural water flow, or hydrology, also affect orchid populations by subtlely influencing natural temperature and humidity. Ionopsis is a combination of two Greek words, meaning appearance of a violet. Utricularoides refers to the plant's resemblance to the flowers of the yellow bladderwort family. Delicate violet orchid is a member of Orchidaceae, the orchid family. Other common names: delicate ionopsis. 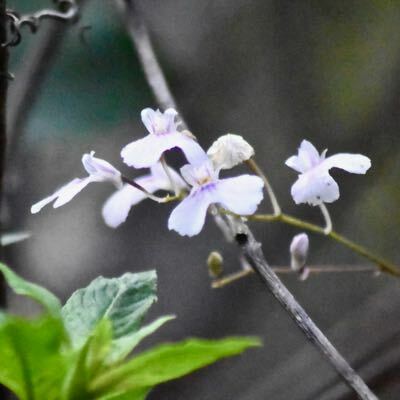 Editor's note: A good resource on delicate violet orchid and other plants is George Gann's 2015 report, Vascular Plant Species of Management Concern, Everglades National Park, page 108.